This set of Microwave Engineering Interview Questions and Answers for freshers focuses on “Impedance Matching Using Slotted Lines”. Explanation: Slotted line allows the sampling of the electric field amplitude of a standing wave on a terminated line. With this device, SWR and the distance of the first voltage minimum from the load can be measured, from this data, load impedance can be found. 2. A slotted line can be used to measure _____ and the distance of _____________ from the load. Explanation: With a slotted line, SWR and the distance of the first voltage minimum from the load can be measured, from this data, load impedance can be found. Explanation: Although slotted lines used to be the principal way of measuring unknown impedance at microwave frequencies, they have largely been superseded by the modern network analyzer in terms of accuracy, versatility and convenience. Explanation: ┌= (SWR-1)/ (SWR+1). Substituting for SWR in the above equation for reflection co-efficient, given SWR is 1.4, reflection co-efficient is 0.16667. Explanation: SWR= (1+┌)/ (1-┌). Where ┌ is the reflection co-efficient. Substituting for the reflection co-efficient in the equation, SWR is 2.3333. Explanation: here, θ is the phase of the reflection co-efficient. Lmin is the distance from the load to the first minimum. Since voltage minima repeat every λ/2, any multiple of λ/2 can be added to Lmin . Explanation: Lmin is defined as the distance between the terminating load of a transmission line and the first voltage minimum that occurs in the transmission line due to reflection of waves from the load end due to mismatched termination. Explanation: ┌= (SWR-1)/ (SWR+1). Substituting for SWR in the above equation for reflection co-efficient, magnitude of the reflection co-efficient is 0.2. To find θ, θ=π+2βLmin, substituting Lmin as 1.48cm, θ=86.4⁰. Hence converting the polar form of the reflection co-efficient into rectangular co-ordinates, reflection co-efficient is 0.0126+j0.1996. Explanation: ZL=Z0 (1+┌)/ (1-┌). Substituting the given values of reflection co-efficient and characteristic impedance, ZL is 47.3+j19.7Ω . Explanation: ZL=Z0 (1+┌)/ (1-┌), this is the expression for load impedance. Normalized load impedance is the ratio of load impedance to the characteristic impedance, taking ZLL/Z0 as 2, the reflection co-efficient is equal to 0.33334. 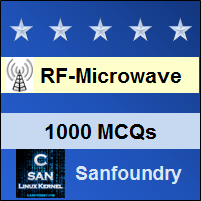 To practice all areas of Microwave Engineering for Interviews, here is complete set of 1000+ Multiple Choice Questions and Answers.